Camp sessions are based on grade level in school. The grade that the string student will be entering in fall of 2019 will determine which camp to attend. * Beginner string students who will be in 6th grade in the fall of 2019 will attend Camp Dolce. Advanced 6th grade students who are very comfortable with reading music have the option to attend Camp Allegro (please see description of Camp Allegro and and Camp Presto on the General Info page). 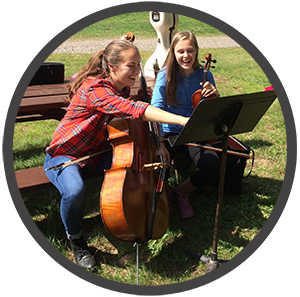 Advanced 6th grade students wishing to attend Camp Allegro must obtain the signature of a private teacher or orchestra teacher on the downloadable teacher recommendation form found in the online registration form and here. + High School seniors who just graduated in the spring of 2019 (notated as grade 12+) are welcome to attend Camp Vivace! Please contact SSA Executive Director, Danielle Simandl, with any questions. Contact info can be found on the Contact page. ** Camp Grande is a one-day session for adult string students of any level. Please see description of session on the General Info page.